Winter 2019 Our seasonal collection of partyware, balloons and fancy dress includes everything to make the most wonderful time of the year even more magical. The book is split into key sections by occasion; Christmas, Hanukkah and New Year’s Eve to make browsing straightforward. You’ll also find the full selection of themed balloons available towards the back of the book to complement the ranges. From snowman themed decorations, to Elf on the Shelf balloons and New Year’s Eve party kits… it’s all here. Let the countdown begin! Our party showroom in Milton Keynes displays over 10,000 party, balloon and dress-up products. If you would like to visit, please call 01908 288500 to book an appointment or contact your area account manager. NEWsletter Stay up to date with our new launches by signing up to our newsletter. You can easily do this by filling in the sign up form in the About Us section on our website. Welcome! So much NEWness! e Hola! G t the latest. to C h e c k i u t.
Tableware •	Ensembles. . . . . . . . . . . . •	Winter tableware. . . . . . . •	Solid Colour Tableware. . . •	Candy Buffet . . . . . . . . . . •	Bakeware & Accessories. .
Decorations & Accessories •	Centrepieces . . . . . . . . . . . . . . . . . . . . 24 •	Confetti. . . . . . . . . . . . . . . . . . . . . . . . 25 •	Hanging Decorations & Banners. . . . 26-36 •	Wall Decoration Kits. . . . . . . . . . . . 37-39 •	Window Decorations & Crepe Streamers.40 •	Standing. . . . . . . . . . . . . . . . . . . . . . . 41 •	Games & Activities. . . . . . . . . . . . . . . . 42 •	Favours. . . . . . . . . . . . . . . . . . . . . . . . 43 •	Photo Props. . . . . . . . . . . . . . . . . . . . . 44 •	Gift Bags & Tags . . . . . . . . . . . . . . . . . 45 •	Stockings & Gift Sacks . . . . . . . . . . . . . 46 •	Piñatas . . . . . . . . . . . . . . . . . . . . . . . . 47 Dress-Up •	Licensed - The Grinch . . •	Children’s Costumes. . . •	Adult’s Costumes . . . . . •	Wearable Accessories . New Year’s Eve Themed Ranges •	Roaring 20s. . . . . . . •	Disco Ball Drop . . . . •	Midnight NYE . . . . . •	Elegant Celebration . Tableware •	NYE Tableware . . . . . . . . . . . . . . . . . . 88 •	Drinkware. . . . . . . . . . . . . . . . . . . 89-90 •	Solid Colour Tableware. . . . . . . . . . 91-93 Decorations & Accessories •	Centrepieces . . . . . . . . . . . . . . . •	Confetti. . . . . . . . . . . . . . . . . . . •	Hanging Decorations & Banners. . •	Solid Colour Decorations. . . . . . . •	Decoration Kit & Photo Props. . . . •	Party Poppers. . . . . . . . . . . . . . . •	Streamers & Cannons. . . . . . . . . •	Confetti & Noise Makers. . . . . . .
•	Headware. . . . . . . . . •	Wearble Accessories . •	Party Kits. . . . . . . . . . •	Glow in the Dark . . . .
Christmas •	Licensed Characters . . . . . . . . •	Themed. . . . . . . . . . . . . . . . . •	Insiders™ . . . . . . . . . . . . . . . •	Standard. . . . . . . . . . . . . . . . •	Junior Shape & Specialty. . . . . •	SuperShape™ . . . . . . . . . . . . •	Inflate-a-fun & Sitting Balloons . •	Mini Balllons . . . . . . . . . . . . .
New Year •	Themed. . . . . . . . . . . . . . . . . . •	Standard & Mini Shape. . . . . . . •	UltraShape™ & SuperShape™. . •	Jumbo Numbers. . . . . . . . . . . . •	Numbers. . . . . . . . . . . . . . . . . •	Retail Latex & Accessories. . . . . •	Decorator Latex . . . . . . . . . . . .
4 different banners in each pack! 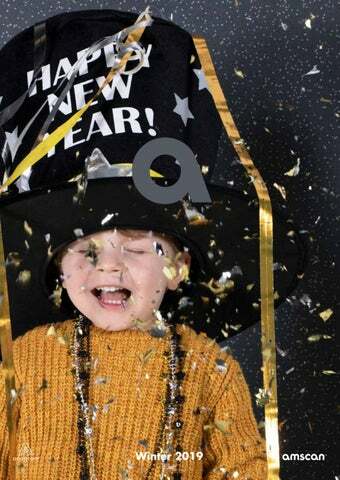 New Year’s Eve - Scene Setters & Photo Props Includes foil backdrop! as seen on our cover! anagram insiders™ are 2 balloons in 1! A clear film balloon on the outside and a foil balloon on the inside. Each Insiders™ balloon has two inflation points and is easy to inflate. Instructions are included with each balloon. Helium makes balloons float. It’s a non-toxic inert gas and is perfectly safe when used correctly. foil nozzle Use to inflate all foil balloons except Orbz™ balloons. latex nozzle Use with caution! Use to inflate Orbz™ bal loons. Should NOT be used with foil balloons. incorrect nozzle DO NOT use with foil balloons! 7.8.1 it does so as principal and not as Amscan’s agent; and 7.8.2 title to the Products shall pass from Amscan to the Buyer immediately before the time at which resale by the Buyer occurs. 7.9 On termination of the Contract, howsoever caused, Amscan’s (but not the Buyer’s) rights contained in this Condition 7 will remain in effect. 8.1 Amscan warrants that (subject to the other provisions of these Terms and Conditions) on delivery and for a period of 6 months from the date of delivery the Products will be free from defects in material or workmanship. Amscan shall not be liable for a breach of the warranty in this Condition 8.1 if: 8.1.1. the Products have been improperly altered in any way whatsoever, or have been subject to misuse or unauthorised repair; 8.1.2. the Products have been improperly installed or connected; 8.1.3. any instructions as to storage of the Products have not been complied with in all respects; or 8.1.4. the Buyer has failed to notify Amscan of any defect or suspected defect within 14 days of delivery where the defect should be apparent on reasonable inspection, or within 14 days of the same coming to the knowledge of the Buyer where the defect is not one which should be apparent on reasonable inspection, and in any event no later than 6 months from the date of delivery. 8.2. Subject to Condition 8.1 if any Product does not conform to the warranty in Condition 8.1 Amscan shall refund the price of such Product or if agreed with Amscan replace such Product. If Amscan so requests the Buyer shall return the Product which does not conform with the warranty in Condition 8.1 to Amscan. 8.3. Subject to Conditions 8.6 and 8.7 Amscan’s maximum aggregate liability for any breach of the warranty in Condition 8.1 (whether in contract, tort, breach of statutory duty, restitution or otherwise) will be limited to the price of the Product. 8.4. 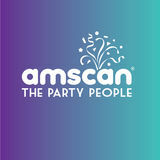 Any Products which have been replaced will belong to Amscan. Any replacement Products will be warranted under the terms specified in Condition 8.1 for the unexpired portion of the 6 month period from the original date of delivery of the replaced Products. 8.5. In the event of any breach of Amscan’s express obligations under Conditions 6.3, 8.1, 8.2 and 8.4 above the remedies of the Buyer will be limited to damages. 8.6. Amscan does not exclude or limit its liability (if any) to the Buyer: 8.6.1. for breach of Amscan’s obligations arising under section 12 Sale of Goods Act 1979 or section 2 Supply of Goods and Services Act 1982; 8.6.2. for personal injury or death resulting from Amscan’s negligence; 8.6.3. under section 2(3) Consumer Protection Act 1987; 8.6.4. for fraud or fraudulent misrepresentation; 8.6.5. for any matter for which Amscan is not permitted by law to exclude or limit (or to attempt to exclude or limit) its liability. 8.7. Subject to Conditions 6.3 and 8.1 to 8.6, Amscan will be under no liability to the Buyer whatsoever (whether in contract, tort (including negligence), breach of statutory duty, restitution or otherwise) for any injury, death, damage or direct, indirect or consequential loss (all three of which terms include, without limitation, pure economic loss, loss of profits, loss of business, depletion of goodwill and like loss) howsoever caused arising out of or in connection with: 8.7.1. any of the Products, or the manufacture or sale or supply, or failure or delay in supply, of the Products by Amscan or on the part of Amscan’s employees, agents or sub-contractors; 8.7.2. any breach by Amscan of any of the express or implied terms of the Contract; 8.7.3. any use made or resale by the Buyer of any of the Products, or of any product incorporating any of the Products; or 8.7.4. any statement made or not made, or advice given or not given, by or on behalf of Amscan or otherwise under the Contract. 8.8. Subject to Conditions 6.3 and 8.1 to 8.6, Amscan hereby excludes to the fullest extent permissible in law, all conditions, warranties and stipulations, express (other than those set out in the Contract) or implied, statutory, customary or otherwise which, but for such exclusion, would or might subsist in favour of the Buyer. 8.9. Each of Amscan’s employees, agents and sub-contractors may rely upon and enforce the exclusions and restrictions of liability in Conditions 6.3, 8.3 and 8.5 to 8.8 in that person’s own name and for that person’s own benefit, as if the words “its employees, agents and sub-contractors” followed the word Amscan wherever it appears in those conditions save each reference in Condition 8.7.1. 8.10. Subject to Conditions 8.2, 8.6 and 8.7 Amscan’s aggregate liability under these conditions (whether in contract by way of indemnity or otherwise) or tort (including negligence) breach of statutory duty restitution or otherwise) for any damage or loss howsoever caused will be limited to the price of the Products except as expressly provided in these Conditions. 8.11. The Buyer acknowledges that the above provisions of this Condition 8 are reasonable and reflected in the price which would be higher without those provisions, and the Buyer will accept such risk and/or insure accordingly. 9. FORCE MAJEURE Amscan will not be liable to the Buyer for any failure or delay or for the consequences of any failure or delay in performance of the Contract, if it is due to any event beyond the reasonable control of Amscan including, without limitation, acts of God, war, industrial disputes, protests, fire, tempest, explosion, an act of terrorism and national emergencies and Amscan will be entitled to a reasonable extension of time for performing such obligations. 10. TERMINATION 10.1. Amscan may by written notice terminate the Contract immediately if any of the following events happen, or Amscan reasonably believes that such events are about to happen: 10.1.1. the Buyer suspends, or threatens to suspend, payment of its debts, or is unable to pay its debts as they fall due or admits inability to pay its debts, or (being a company) is deemed unable to pay its debts within the meaning of section 123 of the Insolvency Act 1986, or (being an individual) is deemed either unable to pay its debts or as having no reasonable prospect of so doing, in either case, within the meaning of section 268 of the Insolvency Act 1986, or (being a partnership) has any partner to whom any of the foregoing apply; 10.1.2. the Buyer commences negotiations with all or any class of its creditors with a view to rescheduling any of its debts, or makes a proposal for or enters into any compromise or arrangement with its creditors other than (where the Buyer is a company) where these events take place for the sole purpose of a scheme for a solvent amalgamation of the Buyer with one or more other companies or the solvent reconstruction of the Buyer; 10.1.3. (being a company) a petition is filed, a notice is given, a resolution is passed, or an order is made, for or in connection with the winding up of the Buyer, other than for the sole purpose of a scheme for a solvent amalgamation of the Buyer with one or more other companies or the solvent reconstruction of the Buyer; 10.1.4. (being an individual) the Buyer is the subject of a bankruptcy petition or order; 10.1.5. a creditor or encumbrancer of the Buyer attaches or takes possession of, or a distress, execution, sequestration or other such process is levied or enforced on or sued against, the whole or any part of its assets and such attachment or process is not discharged within 14 days; 10.1.6. (being a company) an application is made to court, or an order is made, for the appointment of an administrator or if a notice of intention to appoint an administrator is given or if an administrator is appointed over the Buyer; 10.1.7. (being a company) a floating charge holder over the Buyer's assets has become entitled to appoint or has appointed an administrative receiver; 10.1.8. a person becomes entitled to appoint a receiver over the Buyer's assets or a receiver is appointed over the Buyer's assets; 10.1.9. any event occurs, or proceeding is taken, with respect to the Buyer in any jurisdiction to which it is subject that has an effect equivalent or similar to any of the events mentioned in Condition 10.1.1 to Condition 10.1.8 (inclusive); 10.1.10. the Buyer suspends, threatens to suspends, ceases or threatens to cease to carry on all or substantially the whole of its business. 10.1.11. the Buyer's financial position deteriorates to such an extent that in the Supplier's opinion the Buyer's capability to adequately fulfil its obligations under the Contract has been placed in jeopardy; and 10.1.12. (being an individual) the Buyer dies or, by reason of illness or incapacity (whether mental or physical), is incapable of managing his or her own affairs or becomes a patient under any mental health legislation. 10.2. The termination of the Contract howsoever arising is without prejudice to the rights, duties and liability of either the Buyer or Amscan accrued prior to termination. The conditions which expressly or impliedly have effect after termination will continue to be in force notwithstanding termination. 11. GENERAL 11.1. Time for performance of all obligations of Amscan is not of the essence. 11.2. Each right or remedy of Amscan under the Contract is without prejudice to any other right or remedy of Amscan whether under the Contract or not. 11.3. If any condition or part of the Contract is found by any court, tribunal, administrative body or authority of competent jurisdiction to be illegal, invalid or unenforceable then that provision will, to the extent required, be severed from the Contract and will be ineffective, without, as far as is possible, modifying any other provision or part of the Contract and this will not affect any other provisions of the Contract which will remain in full force and effect. 11.4. No failure or delay by Amscan to exercise any right, power or remedy will operate as a waiver of it, nor will any partial exercise preclude any further exercise of the same, or of any other right, power or remedy. 11.5. Save as set out in the Contract, these Terms and Conditions may only be varied or amended in writing and signed by a director of Amscan. 11.6. Amscan may assign, delegate, license, hold on trust or sub-contract all or any part of its rights or obligations under the Contract. 11.7. The Contract is personal to the Buyer who may not assign, delegate, license, hold on trust or sub-contract all or any of its rights or obligations under the Contract without Amscan’s prior written consent. 11.8. The Contract contains all the terms which Amscan and the Buyer have agreed in relation to the Products and supersedes any prior written or oral agreements, representations or understandings between the parties relating to such Products. The Buyer acknowledges that it has not relied on any statement, promise or representation made or given by or on behalf of Amscan which is not set out in the Contract. Nothing in this Condition 11.8 will exclude any liability which one party would otherwise have to the other party in respect of any statements made fraudulently. 11.9. Save as set out in Condition 8.9 the parties to the Contract do not intend that any of its terms will be enforceable by virtue of the Contracts (Rights of Third Parties) Act 1999 by any person not a party to it. Amscan may vary or rescind the Contract without the consent of any officer, employee, agent or sub-contractor of Amscan. 11.10. Any notice in connection with the Contract will be in writing addressed to the other party at its registered office, or principal place of business and will be delivered by hand, or first class or special delivery post. The notice will be deemed to have been duly served, if delivered by hand, when left at the proper address for service or if made by pre-paid, first class post or special delivery post, 48 hours after being posted. 11.11. The formation, existence, construction, performance, validity and all aspects whatsoever of the Contract or of any term of the Contract will be governed by English law. The English courts will have exclusive jurisdiction to settle any dispute which may arise out of, or in connection with the Contract. The parties agree to submit to that jurisdiction.